Toyota Motor Sales U.S.A. Inc. eased off on incentives in September but still posted a 17 percent gain in sales, paced by strong demand for light trucks. In September, Toyota cut its incentive spending for all brands combined 8 percent from August levels, TrueCar.com estimated. 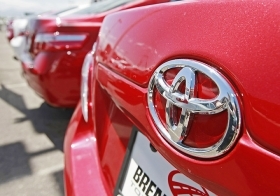 While below the industry's September average of $2,683, the $1,870 in incentives that Toyota spent per vehicle on average last month was still 38 percent higher than what it spent in September 2009, TrueCar.com data showed. Carter said Toyota's incentives typically are about a third of the industry average. Toyota hiked its spiffs to historically high levels earlier in the year to lure customers in the wake of its recall crisis. Through August, Toyota's U.S. sales, including Scion and Lexus brands, were down about 1 percent compared with an industrywide gain of about 8 percent. But a boom in Toyota Division truck and SUV sales in September helped the automaker move into positive sales territory for the year. Toyota Motor Sales sold 1.31 million vehicles through September, up 2 percent from the year-earlier period. Toyota brand SUV sales jumped nearly 60 percent to 28,827. Toyota RAV4 sales climbed 41 percent to 14,685. Demand for Toyota Division pickups rose 14 percent to 15,797. At Lexus, light-truck sales dipped 2 percent to 8,813. Combined Toyota and Lexus brand sales of light trucks -- including SUVs, pickups and minivans – rose 34 percent to 63,357 in September. Carter acknowledged a “resurgence” in truck and SUV demand, but said that the automaker views the gains as an example of short-term volatility, not a long-term trend. Carter acknowledged that trucks and SUVs have been increasing their share of the industry's sales of late, “but it's more a reflection of different segments having different levels of pent-up demand,” he said. Carter said replacement purchases are fueling much of the demand for trucks. “The overall pattern is going to be continued to be (towards) more fuel efficiency and lower emissions vehicles,” he said. Still, combined Toyota and Lexus light truck sales through September were up 14 percent from the year-earlier period to 544,799 units, offsetting a 6 percent decline in the automaker's passenger car sales during the same period. In September, Toyota Motor Sales' car sales for all brands rose 7 percent to 83,805.